Rotten Tomatoes has picked the 100 worst movies of the current decade, according to critics’ ratings. At the very bottom is Ballistic: Ecks vs. Sever (2002), named the worst movie of the past 10 years. So congratulations Hugo voters! Not a single movie on the list of 100 made the final ballot as a Best Dramatic Presentation nominee. That’s better than fandom did the previous decade. Alternative Reel’s list of 50 worst movies of the Nineties ranked 1993 Hugo nominee Bram Stoker’s Dracula as #8. Did the fans or mundanes call that one right? Think Keanu Reeves in blue granny glasses and there’s your answer. Joe Haldeman remains in ICU on a respirator according to Gay Haldeman’s post of September 25. Doctors plan to slowly wean him off the respirator beginning today. He also is scheduled for a CAT scan. Update 09/25/2009: Gay posted later that Joe will remain on the respirator at least today. Also, the CAT scan showed no infection but the pancreas is still inflamed. Barbara Bova died this week, reports SF Site. She ran a literary agency and had been married to Ben Bova for 35 years. The Dark Side: Dead or Undead? Got a letter through the post today saying that my subscription to ‘Dark Side’ magazine was being suspended due to the current financial climate forcing the magazine to cease publication until they hope sometime in the new year, when a relaunch is planned in a ‘brand new’ format…something similar was said about the ‘Hammer Horror’ magazine, which vanished forever into the ether…so doesn’t sound very optimistic, does it? FlashForward, the tv series based on a novel by Robert Sawyer, has just premiered(*). While the author is enjoying maximum name recognition, ISFiC Press is seizing the opportunity to advertise its collection of his stories, Relativity, and use the author’s popularity to attract attention to the press’s other books. Discounts are available – the more you buy, the more you save. (*) And the Crotchety Old Fan reviews it here. “Nothing’s changed for Joe. He’s just healing,” is Gay Haldeman’s update for September 24. Props, costumes and set-pieces belonging to Stan Winston, Academy Award-winning visual effects creator, will be auctioned October 8-9 by Profiles in History. 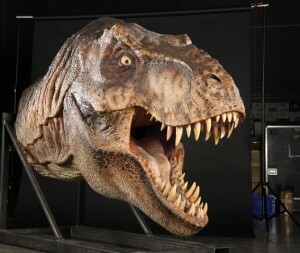 The items, some enormous in size, come from the Jurassic Park, Terminator and Predator film franchises, movies like A.I. : Artificial Intelligence and many more. A portion of the proceeds from the sale of these items will fund the new Stan Winston Visual Effects Scholarship at the University of Southern California Film School. Handed in resignation to stupid day job boss and spend day looking at Ferraris. Red is nice. Might do novel manuscript in red also. With ZapfChancery font. You might like the Star Trek themed entry, too. 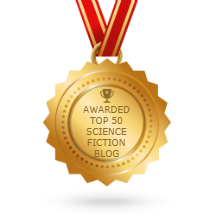 (2) Kim Stanley Robinson surprises readers by documenting that Virginia Woolf was a fan of Olaf Stapledon, and praises at length the heirs of Stapledon responsible for the current golden age of British science fiction. Included in the items the German army allowed humanitarian groups to distribute in care packages to imprisoned soldiers, the game was too innocent to raise suspicion. But it was the ideal size for a top-secret escape kit that could help spring British POWs from German war camps. The British secret service conspired with the U.K. manufacturer to stuff a compass, small metal tools, such as files, and, most importantly, a map, into cut-out compartments in the Monopoly board itself. (5) There can’t be too many folks named Gasperik. I wonder if the fellow shown here working on Its Always Sunny in Philadelphia is a relative of that well-known LASFSian and inspirer (if that’s a word) of Niven/Pournelle characters, the late Frank Gasperik? Sophisticated computer scans of fossils have helped solve a mystery over the nature of a giant, ancient raptor known as the Haast’s eagle which became extinct about 500 years ago, researchers said Friday. The researchers say they have determined that the eagle – which lived in the mountains of New Zealand and weighed about 40 pounds (18 kilograms) – was a predator and not a mere scavenger as many thought. Much larger than modern eagles, Haast’s eagle would have swooped to prey on flightless birds – and possibly even the rare unlucky human. Instead of prairie grasses, Wikipedia’s natural resource is an emotion. “There’s the rush of joy that you get the first time you make an edit to Wikipedia, and you realize that 330 million people are seeing it live,” says Sue Gardner, Wikimedia Foundation’s executive director. In Wikipedia’s early days, every new addition to the site had a roughly equal chance of surviving editors’ scrutiny. Over time, though, a class system emerged; now revisions made by infrequent contributors are much likelier to be undone by élite Wikipedians. Chi also notes the rise of wiki-lawyering: for your edits to stick, you’ve got to learn to cite the complex laws of Wikipedia in arguments with other editors. Together, these changes have created a community not very hospitable to newcomers. Chi says, “People begin to wonder, ‘Why should I contribute anymore? '” – and suddenly, like rabbits out of food, Wikipedia’s population stops growing. (8) The US military is getting back in the airship business — see page 8 of this article in Newsweek. Lockheed Martin’s website has art and photos of the High Altitude Airship. (9) Tim Powers confirmed to Locus that his novel On Stranger Tides has been optioned by Disney. Elements in his story will be used to concoct a fourth Pirates of the Carribean movie. 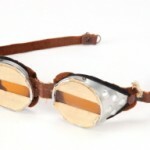 Profiles in History is adding Amelia Earhart’s flight goggles, worn during her historic 1932 record-breaking solo transatlantic flight, to their upcoming auction of Hollywood memorabilia taking place October 8-9, 2009. These goggles were on loan to and exhibited in the Earhart case next to her Lockheed Vega at the Smithsonian National Air and Space Museum from 1993-98. “These goggles are the single most important flight worn aviation artifact to ever be offered at public auction,” said Joe Maddalena, president of Profiles in History. Interest is heightened because the Amelia Earhart movie will be released a short time after the auction. Other flight-related items included in the auction are astronaut Gus Grissom’s worn Mercury flight suit and Neil Armstrong baseball cap worn after splash-down and recovery from the historic Apollo 11 mission to the moon.